Lightfoot the Deer is a story about animals in the Green Forest that are hunted in the fall. 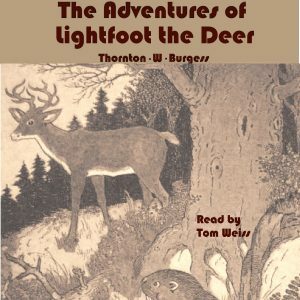 The story is mostly about Lightfoot, a male deer hunted by one hunter and describes how he tries to escape being shot. The story tells Lightfoot’s encounter with another buck and a battle for territory and the lovely, Miss Daintyfoot. As with most Thornton Burgess books, young listeners learn valuable lessons about nature, wildlife, and positive morals.